Fact that the price of gold in 2011 is around USD 1430 per troy ounce would be interesting if we compare to 25 years ago when its price being no more than USD 400 per troy ounce. How significant is the increase of the gold price? What is prediction for the future gold price? How we can predict the future project value with the gold price increase? To figure out the pattern of gold price and forecast to the future, we need to plot the data of gold price from previous years, and analyze the regression. Then plot it to the graph, and add a best fitting trendline. Seems that the Polynomial Order 3 Trendline is quite fit Since the R value is 0.979 close enough to 1. 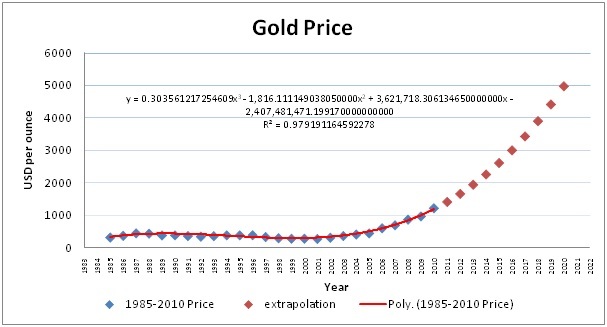 Using the equation of polynomial order 3 we can extrapolate the data to forecast the gold price to year 2020. From http://www.kitco.com/scripts/hist_charts/yearly_graphs.plx, we obtain the 2011 average yearly gold price until May is USD 1427.55 per oz. The deviation between real data with the extrapolated data 2011 (1,414.48 ) is about 0.92%. So we can confident with the validity of forecasted data. The recently approved 13 Km 6” gas Pipeline Project at East Kalimantan Gas Production facility in 2011 is cost USD 7,550,000. 1.56 oz per USD 1000,means that the pipeline project at 2011 is worth of 1.56 x 7550 = 11,778 oz of gold. This entry was posted in Adi Nugroho, Week #9. Bookmark the permalink.